The prize is awarded yearly in two categories, one in 'best water management practices' and another one in 'best participatory, communication, awareness-raising and education practices'. Mr. Dámaso de Lario presents Category 1 Award to the representative from Japan. This edition's focus was on Water Cooperation as 2013 is International Year of Water Cooperation and World Water Day 2013 was also dedicated to this important theme. The Award was presented to the winners by Mr. Dámaso de Lario, Ambassador at Large for International Environmental Affairs of Spain, and by Mr. Michel Jarraud, president of UN-Water. Category 1 Award in its edition 2013 was awarded to the project Basin-wide groundwater management using the system of nature, implemented in the city of Kumamoto, Japan, as an example of cooperation between various institutions to maintain and protect the water supply of the city by managing groundwater recharge using abandoned paddies and protecting watershed forests. 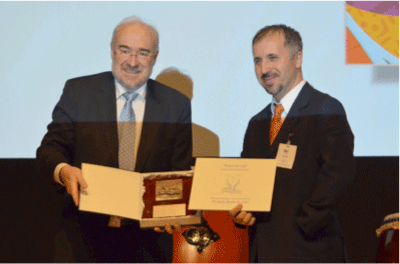 Mr. Jarraud presents Category 2 Award to the representative from Moldova. Category 2 Award in its edition 2013 was awarded to the project Safe Water and Sanitation for all in the Republic of Moldova, for its pedagogical approach and its contribution to the implementation of the Human Right to Water and Sanitation through partnerships between local people and authorities.